Ypres Salient: Tourist Car Route 1914-1918 guide from the Flemish publishers Westtoer, published for centenary of World War I. 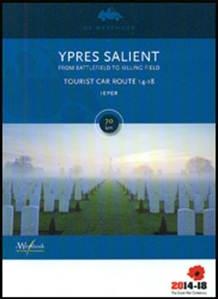 The guide covers a special commemorative “Ypres Salient” route starting from the city’s railway station and ending by its famous Menin Gate. 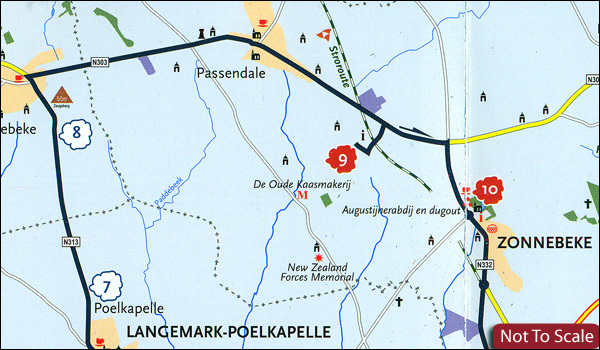 19 important sites are highlighted on a road map provided in the guide, including the Tyne Cot cemetery, Passchendaele / Passendale Memorial Museum, Hill 60, Bedford House Essex Farm cemeteries, etc. All the highlighted sites have informative descriptions, accompanied by colour photos and, where appropriate, panels about individuals connected with them. The guide, indispensible for anyone planning to visit Ypres and the surrounding area, also includes chapters on the Commonwealth War Graves Commission, exploring the city itself, etc. In addition to the map, there is also a road-book providing more detailed driving instructions. The guide is produced on high quality glossy paper and is illustrated throughout with many colour photos.